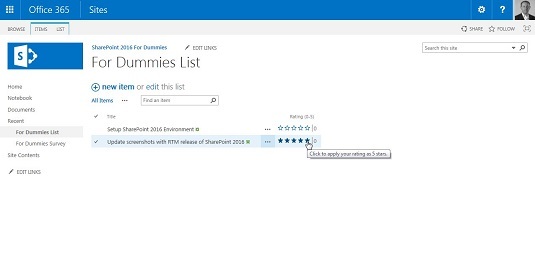 SharePoint 2016 offers you all kinds of settings to customize things exactly the way you want them. Among these many options are the rating, audience targeting, and form settings. Rating settings is a simple Yes/No option to allow the items in the app to be rated by users. The Rating feature is a much requested feature. When enabled on your app, a Rating field appears. The Rating field allows users to select a star rating. In addition to rating items with a star rating, you can also approve of items by using a simple Like button. If you are familiar with social-networking sites like Facebook, then you’ll know how the Like button works. Changing from a star rating to a Like button is accomplished on the Rating Settings page when you enable ratings. The Audience Targeting setting includes one section with a Yes/No option to enable Audience Targeting for the app. Selecting Yes creates a column called Target Audiences in the list or library app. Certain web Parts, such as the Content Query web Part, can use this column to filter list contents based on the user’s inclusion in a specific audience. Audience Targeting isn’t the same thing as permissions. A user can still access content even if he or she isn’t included in an audience. Audience targeting is simply a way to filter the presentation of content to certain groups of people. The Form Settings option is available only for List apps. If InfoPath is installed on your machine, you can opt to allow customization of the list form using InfoPath by selecting the Customize the Current Form Using Microsoft InfoPath radio button. Microsoft didn’t ship InfoPath with Office 2016 and even though this option is still available in SharePoint 2016, you should expect it to go away in the future. Microsoft is moving away from using InfoPath for managing forms in SharePoint.